Came across a nasty little bug when I installed the latest Ubuntu 10.04 (LTS) into a virtual machine using VMWare Fusion 3.02 on my OSX box. This was a fresh install and the install itself went smooth, the problem occured when the initial login screen appeared. Although my mouse worked just fine and I was able to click on the user to log in, I wasn't able to type anything. My keyboard was completely unusable within the virtual machine. I was not able to type any input via the keyboard. After doing some Googling I discovered that once you got past the login screen the keyboard would work fine. The only way to login was to initiate the on-screen keyboard and type in your password. You can bring up the on-screen keyboard by clicking on the Universal Access icon on the lower right hand side of the screen and choosing "Use on-screen keyboard". One side note here, when I first checked the box to use the on-screen keyboard, the keyboard would flash and disappear. What I needed to do was keep the box check and reboot the machine, when the login screen returned, the keyboard was there. Once I logged in the physical keyboard worked fine. I was able to use it in all the applications and didn't notice any problems, but once I logged out and returned to the login screen, again no input from the physical keyboard. Now I needed to fix this. At this point I go into basic trouble resolution mode and decided to start by reinstalling and upgrading the VMWare tools. Not going to get into a step by step here how to do that but the short of it is after reinstalling the VMWare tools and rebooting I was stuck in the same situation and needed to use the on-screen keyboard to log in. Next obvious step, apply all patches to the Ubuntu desktop, did this, rebooted, still no go. For keyboard I selected "Apple" and then just selected the defaults for everything else. 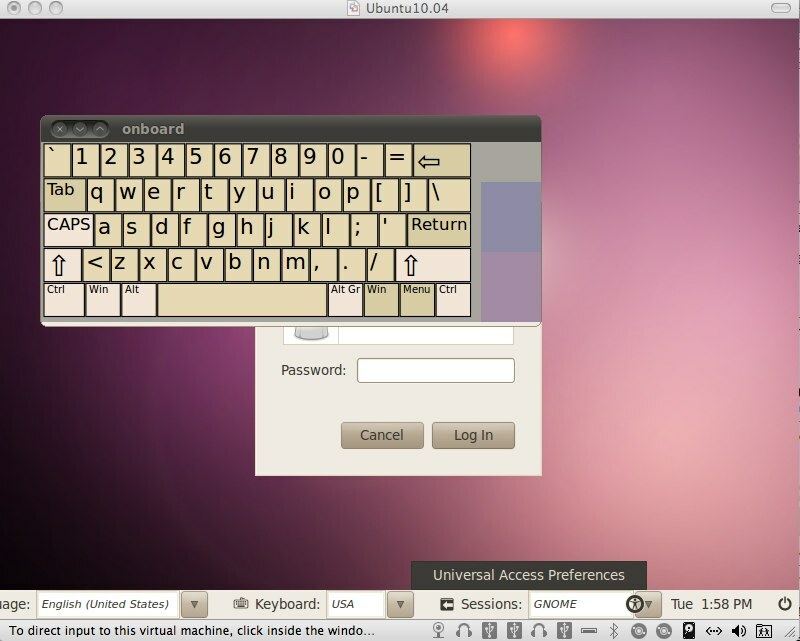 Once I exited the configuration wizard, I restarted the machine and all was right with the Ubuntu world again. Did a couple reboots to make sure and everything seems to be working fine now. This issue occurred on a clean install of the current Ubuntu 10.04 LTS release. I had been previously running the beta version of the 10.04 release which worked fine and never had a problem with the keyboard input. However, after patching that box today, same issue occurred. http://ubuntuforums.org/showthread.php?t=1466482 - A great thread discussion on the issue in general. There were a couple of "fixes" in there including the one I implemented. A couple of post go off track but for the most paart a good thread. https://bugs.launchpad.net/ubuntu/+source/xorg-server/+bug/548891 - The bug report on the issue which also includes the work around.